The results achieved in the socialist industrialization of the country in the course of the 35 years of the people’s state power in Albania are a major victory of the policy of the PLA for the construction of socialism, a policy which, proceeding from the teachings of Marxism-Leninism, set the task of the uninterrupted development of the socialist industrialization of the country as early as the first years after its liberation. Proceeding from this assessment the PLA has considered all the aspects of the socialist industrialization of the country as political, ideological, economic and social problems and worked out a correct policy, which it has carried out with success. Today, from the great heights to which the PLA has raised the country in the course of these 35 years of struggle and victories over the external and internal enemies, over all the blockades of the imperialists and revisionists of all hues and colours – Yugoslav, Soviet, Chinese and others, we can see the magnificent results of the policy of the PLA in the socialist industrialization of the country. These successes have transformed Albania into an economically strong country with an unbreakable defence, into an agricultural-industrial country with modern technique and technology, a country which marches steadily on the road of its transformation into an industrial-agricultural country. In the policy of the socialist industrialization of the country the PLA has always implemented the teachings of Marxism-Leninism, giving priority to the extracting and processing heavy industry, as a law of the construction of socialism and the advancement of the proletarian revolution. Under the five-year plans of the development of the economy, the sectors of the heavy industry, and especially those of oil and gas extraction and mining, have been given priority over the other branches of the economy. The large investments made in them have brought about the intensification of geological r-search and enabled the discovery of new sources of oil and gas and minerals, which constitute a powerful base for the rapid development of the mineral extracting and processing industry. Both the extracting and processing heavy industry is now in a position to play a leading role in the extended socialist reproduction; it has become a strong support for the development of the other branches of the industry and economy on a whole. The all-round, uninterrupted and independent development of the extracting and processing industry is, first of all, connected with the process of prospecting and research of oil and gas sources and other useful mineral deposits. Our experience of socialist construction shows that without ensuring the primary fuel and energy resources, without having a strong basis of solid mineral deposits, it is impossible to ensure a complex development at rapid rates. Therefore, immediately after the liberation of the country special care was shown for the setting up and strengthening of the geological service, the extension and strengthening of research and prospecting in order to ensure the necessary oil and gas sources, coal, copper, iron-nickel and other mineral deposits in the shortest time possible. From a country in which the geological service was non-existent, in which the extention of mineral-bearing deposits was unknown, in which only some insignificant deposits of oil, coal, copper and chrome were known, and these only incompletely studied, geological studies and prospecting developed and extended greatly with every five-year plan. As a result, the volume of physical drilling-research work for oil and gas in the 6th Five-Year Plan (1976-1980) is 7 fold as great as that of the 1st Five-Year Plan (1951-1955), whereas in solid mineral ores the amount of work done in the same period is 40-fold greater. Ai present, the geological enterprise of Puka alone is in a position to carry out in a year the whole amount of drilling for useful solid minerals carried out during the whole of the 1st Five-Year Plan. Development is such that the past fades into insignificance in comparison with the present achievements. Good results have been achieved in the study of the geological structure and the mineral-bearing zones of the country. Of 6 mineral ores, which were known and extracted in the 1st Five-year Plan, under the 5th and 6th Five-Year Plans prospecting and drilling has gone on in industrial and geological deposits of 37 useful mineral ores. Considerable industrial and geological deposits of oil and gas, coal, chrome, copper, iron-nickel, nickel-silicate, phosphorites, bituminous sands, construction materials, raw materials, refractory materials and others, have been discovered. 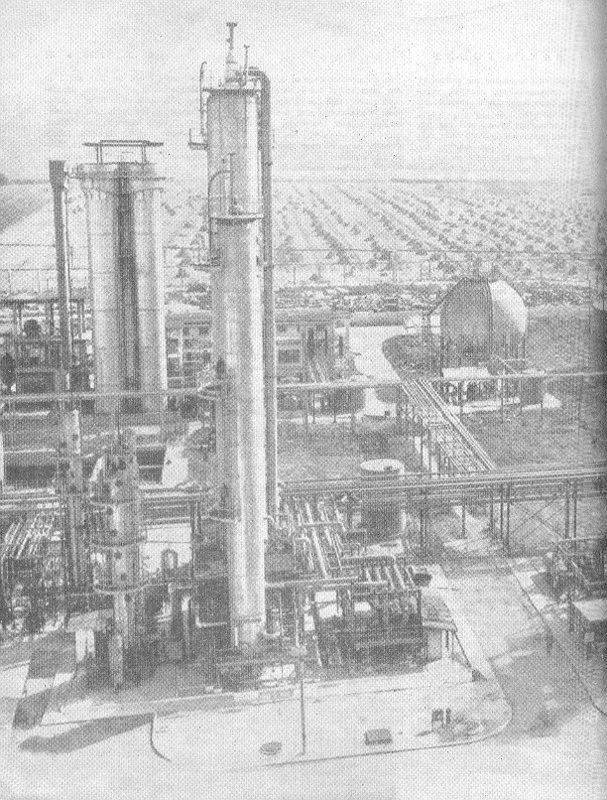 These successes have been achieved in the course of a fierce struggle against internal and external enemies, against the Yugoslav, Soviet and Chinese revisionists, who have endeavoured to disorganize geological work in our country, to convince us that there was no hope of finding in Albania oil and gas, phosphorites, bauxites, poly-metals, asbestos, heavy metals, etc., and to limit and blur the prospects of the exploitation of chrome, copper, coal and other minerals. The far-sighted and consistent stand of the Party in connection with geological prospecting was a major factor in refuting the conclusions of the Soviet revisionist specialists and others, and helping discover large mineral deposits precisely in those areas which were described as perspectiveless. New horizons were opened up and geological work went on with unprecedented vigour following the historic decisions of the 7th Congress of the PLA and the 6th Five-Year Plan. Under this five-year plan geological prospecting for known minerals and new minerals was extended. The volume of work done has increased notably both in the sector of oil and gas, as well as in that of solid minerals. In comparison with the last five-year plan the volume of prospecting-drilling work has increased 31 per cent, and 70 per cent in solid minerals alone, 23 per cent more galleries have been opened and 26 per cent more other operations have been carried out, with the result that the industrial and geological reserves discovered during this five-year plan are by far larger than those discovered during any other five-year plan. Geological prospecting, apart from its intensification in the already known deposits and areas, has now been extended to relatively less known areas. In order to achieve greater effectiveness at work notable improvements have been made in the strengthening of technical and scientific discipline, in the methods of complex geological, geophysical and geochemical prospecting; better work is being done for a more accurate assessment of the value of mineral-bearing zones, as well as the complex evaluation of all minerals and other accompanying elements, etc. The encouraging results achieved during the 6th five-year period in prospecting for new industrial and geological deposits are a guarantee that the tasks of the 6th Five-Year Plan will be fulfilled, and for some minerals will even be over-fulfilled. In this manner it will be possible to achieve a further improvement in the balance of known and new mineral deposits, to step up the development of the extracting and processing industry in the coming five-year plan. The discovery of useful minerals, such as oil and gas, chrome, iron-nickel, coal and others, has become a reliable support for the high-rate and uninterrupted development of the extracting industry. The extracting industry inherited from the past only some small mines, one small oil deposit under exploitation, one small copper mine, two small coal mines, some small opening for the extraction of chromium, a small bitumen mine. These did not constitute any mineral industry in the real meaning of the word. And even these small mines were barbarously exploited in the interests of foreign capital which owned them. Today, on the contrary, we have a developed and well-equipped extracting industry, which turns out large amounts of production, thanks to its high level of mechanization and its technological processes, which match the world standards. Apart from the oil and gas, coal, chrome, copper and bitumen, the needs of the processing industry and the export are also fulfilled through the extraction of iron-nickel, pyrite, phosphorites, magnesite, quartz, dolomites, caolines, construction materials such as clays, sands for bricks, marble, volcanic glass, etc. At present we are in a position to extract 23 minerals against only 6 that were extracted in the 5th Five-year Plan. In the near future the mining industry will extend its field of work with mines for the extraction of the nickel-silicate, bauxites, poly-metals, bituminous sands, asbestos and titanomagnetite. The extraction of oil and gas has increased continuously, not only fulfilling the needs of the country for their by-products, but also making a considerable contribution to the exports. The basic sources of oil extraction over the 35 years of the people's state power have been the deposits discovered by our oil-workers. Today the amount of oil extracted from the oil-bearing areas, which were exploited in the past, constitutes only 0.25 per cent of the total amount, whereas compared with the year 1960 its production has almost doubled. The continuous increase of oil extraction is the result of both the discovery of new deposits, as well as the application of advanced methods and technology, and the placing of work on scientific bases. 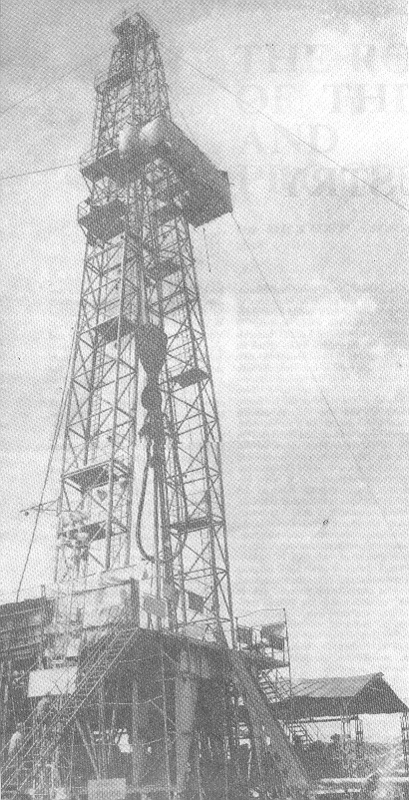 As a result of constant technical-scientific work, the application of intensive extracting methods, there has been a qualitative and quantitative rise, important experiments have been carried out, the industrial application of secondary methods has begun, and new technological processes for the exploitation of viscous oils and deep drilling have been introduced. All this is a guarantee not only for the rational exploitation of the oil deposits, but also for the increase of the amounts of extracted oil. This is the main objective of all the oil-workers in the sector of extraction. Although they lacked experience, relying completely on their own forces, after the 60s, the geological workers discovered gas and condensed gas deposits in relatively great depths and under high pressures. However, very quickly, through strenuous efforts and intensive studies they mastered the technology of the exploitation of such deposits, the work for the drafting of the designs connected with these deposits and their execution, which entailed the solution of many difficult problems in the technology of exploitation, in the system of accumulation, especially of condensed gas, and transportation. The results achieved in gas extraction, especially of the condensed gas, are a guarantee for this important sector to continue its expansion in the future. At the present stage of development, new branches of the mineral industry have taken definite shape. Among them worth mentioning are the coal, chrome, copper, iron-nickel and other mines, which occupy an important place in terms of their specific weight in the economy of the country and the incomes they procure. Today, Albania is in a position to exploit about 60 mines, as against only 6 mines it had in 1944. Instead of the old mines exploited in a primitive manner, without mechanization and with a very low productivity, Albania has now mines of great productivity, such as the “Todo Manço” chrome mine in Bulqiza, and in terms of reserves and production ranks among the largest of its kind in the world. Modern technology has been introduced into mining processes, exploitation systems have been perfected, and today the most advanced technological processes, which have great economic advantages, are used. In the new mines diverse equipment and machinery, which replace the hard work of many hands, are utilized. For the exploitation of minerals in great depths there are today 35 pits, which have been designed and constructed with our own forces. Seen from this angle, the great merit of the PLA comes out more clearly as, with great far-sightedness, it was able to make a correct assessment of the mineral-bearing capacity of the country, and with wisdom and persistence laid out the correct path for the development of the heavy industry, in general, and the mining industry, in particular, setting ever greater tasks to all the branches of the latter, especially the sector of chrome, copper, coal, iron-nickel, bitumen, salt deposits, caoline, quartzite sands, etc., which have become a support for the creation and development of the branches of the processing industry. The growth rates of mineral extraction in Albania bear no comparison with the pre-Liberation period. Suffice it to mention that the entire coal production of the year 1938 is realized in less than one day in 1979, chrome production in 2.7 days, copper production of the year 1946 in less than four days, and so on. Increased mineral production has made Albania known in the world as one of the countries with a developed mining industry. According to statistical data of 1977, Albania comes third in the world in the extraction of chrome, and the statistical year-book of 1976 ranks Albania the 14th in the production of nickel, ahead of such countries as Finland, the German Federal Republic, Brazil, Poland, and many others which, likewise, are known to be great nickel producers. In the production of copper Albania ranks the 31st in the world, among the 61 countries which are considered the main copper producers, before Bolivia, Portugal, Morocco, Brazil, German Federal Republic, Italy and others, which likewise are important copper producers. Views of the urea plant, Fier. The mining industry in Albania assumed a still greater development after the 60s. In this period great progress was made not only as regards the quantity, but also the quality of production through the commissioning of new mines and the increased production capacity in the existing ones. The measures taken immediately after the 4th Congress of the Party and in the spirit of its directives brought about a further expansion of the mining industry and its production. At the 5th and 6th Congresses, in compliance with the stage of the country’s development, the Party set still greater tasks to the mining industry, for raising production both quantitatively and qualitatively, so that mineral production increases in order to help not only the development of the processing industry at home, but also the expansion of the export of minerals and their products. Good results were quick to follow. In 1975, as against 1960, when the savage blockade of the Soviet revisionists began, total industrial production rose 3.9 fold, while the production of the oil and chrome industry increased 7.1 fold, and so on. For this purpose, intensive work was done for a more effective exploitation of the great mineral wealth of the country, the most rational exploitation of mineral deposits, and the constant increase of labour productivity through raising the level of mechanization and qualification. The 7th Congress of the Party, held in 1976, set still greater tasks for the mining industry, for its development as rapid rates. Under the 6th Five-year Plan (1976-1980) the rapid development of industry, in general, was directly connected with the expansion of the mining industry in both its extracting and processing branches. In 1980, as against 1975, the plan envisages that the extraction of chromium ore should be raised 47 per cent, of copper 55 per cent, of coal about twofold, of iron-nickel ore 3.5 fold, etc. Parallel with all this, great progress has been made in mining technique, especially in deep galleries. Mining machinery and equipment, which meet the most advanced technical conditions, have a positive effect in the constant increase of labour productivity. Not only the common hammer and the telescopic hammer are used with success in our mines, but also carriage-drilling, the most advanced method of drilling to date. Prefabricated elements are already used with success and more of them will be used in the future, especially in the coal mines. Now the goal is that all mines should be .mechanized, especially the larger ones, through the installation of modern machinery and equipment produced in Albanian mechanical-engineering shops and plants, after scientific studies and experiments carried out by our people working in this sector. The solution of the complex problems of mining is connected with concrete studies and experiments, in keeping with the conditions of every sector or mine. In the future, these studies, which will become ever more necessary, will be further extended as the depth of mining work grows, which brings out ever new unsolved problems. A qualitative leap has been made in the field of oil processing. 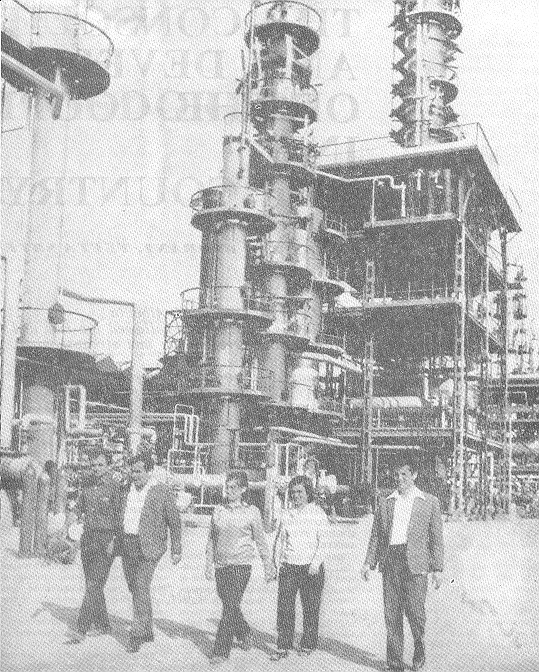 A chain of oil-processing plants was set up, and in 1978 the deep oil-processing plant in Ballsh came into production. With all the sabotage acts by the Chinese revisionists, our workers and specialists created all the conditions to process the whole amount of extracted oil locally and to ensure all the main products of this kind for the whole economy. Thus, all possibilities exist for ensuring in the not-too-distant future the necessary equipment for the production of new oil by-products sud the setting up of the petrochemical industry, through which our country will be able to cut the import of chemical and various other materials produced from oil processing and to raise the value of oil and its by-products as primary materials. The processing of solid minerals begins with the up-grading and enrichment of poor minerals and ends with the smelting of such minerals as copper, iron-nickel, chromium, etc. In the situation created after the revisionist blockade in 1960 the PSR of Albania was still in the initial steps and lacking experience in the enrichment of poor-graded mineral ores. This was the time when the first copper enrichment plant was commissioned in Kurbnesh. Proceeding from the tasks set by the 4th Congress of the Party for the period 1961-1965 for the setting up of new branches of industry, for the local processing of primary materials of mineral origin, a number of measures were adopted bearing on the expansion and strengthening of this important sector of the mining industry. In the sector of mineral enrichment, the obstacles raised by the savage imperialist-revisionist blockade were overcome with the building of other dressing factories and the perfectioning of technological processes. Today there operate in Albania three factories for the enrichment of copper, two for the enrichment of coal, two for the enrichment of chromium ore, and one for the enrichment of iron-nickel ore. The number of these factories will further increase in the future. Very important steps forward have been taken also in the designing of enriching factories, which are the work of our own specialists. The important thing in them is that 90 per cent of the machinery is produced in the mechanical-engineering plants of the country, which constitutes a sound base for the further extension of the enriching sector for all kinds of mineral ores. Today, one third of blister copper production is obtained from the copper concentrates turned out of enriching factories. In the future this figure will grow still more, because the mineral enriching through the building of enriching factories close to mineral deposits helps reduce cost of transport and raise profitability. One of the most developed branches of our metallurgical industry is today the industry of copper extraction and processing. The development rates of the copper industry are extremely high. This has been achieved with the setting up of the copper smelting plant at Rubik, which produces blister copper, and of another plant in Kukës. Later possibilities were created to go over to a more advanced processing of blister copper to the production of new articles. The 1960 blister copper production is now realized in less than two months. From this the transition was made to a higher stage of copper refining with the setting up of a copper refining plant at Rubik, and a copper wires and cables plant in Shkodra. Thus was ensured the full cycle of the local processing of copper, which has very much raised the profitability of this branch. In the same manner, the value of export copper was increased due to the fact that in 1979 about 85 per cent of copper is exported in the form of processed products, and only 15 per cent as blister copper. With the coming into production of the pyrometallurgical plant at Laç, in which copper concentrates and high content copper ores will be smelted to obtain refined copper, sulphuric acid, copper sulphate, all the amount of blister copper will be processed locally, and many copper products will be made available for export. In the future, the copper industry will increase its processing capacity producing new articles for the fulfilment of the needs of the economy and for export, such as copper pipes, profiles, sheets, alloys, etc. In 1976 the first steps were taken in the setting up of a heavy processing industry, the industry of black metallurgy. The sheet rolling plant was commissioned in Elbasan. With the selfless work of the working class, breaking the savage imperialist-revisionist blockade and the sabotage activity of the Chinese revisionists, the “Steel of the Party” metallurgical combine was set up, the magnificent work of the PLA. In 1979 work began in another branch of our metallurgical industry, that of ferro-chromium, which produces carbonic ferro-chromium and others from the processing of chromiferrous minerals. The successes achieved in the setting up, strengthening and further progress in the extracting and processing industry of oil and gas, chromium, copper, coal, iron-nickel, etc., have strengthened the defence, have become a strong support for the constant advance and the vigorous development of the economy in the PSR of Albania. 1 Enver Hoxha, Works, vol. 20, p. 121, Alb. ed.